The Sards require very little prompting when it comes to organising local festivities, especially occasions when the locals turn out to advertise their various products and sample the fruits of the seasons. The more famous events are the cherry feasts in June and the citrus and chestnut feasts in the autumn. Over the years I’ve attended various local events including a potato feast in Gavoi, chestnut feast in Desulo, a bread and olive oil feast in Santadi and a saffron festa in San Gavino Monreale. Artichokes, wine, fish, cheese and fungi all have weekends dedicated to their consummation including the not to be forgotten, festa of the ubiquitous snail in early autumn. 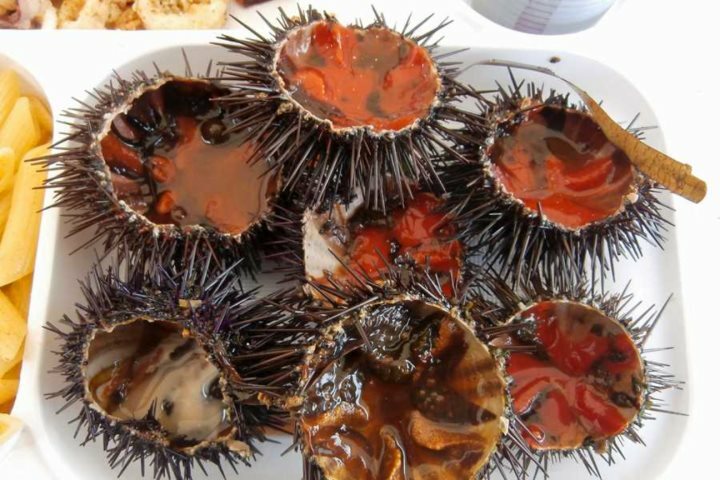 However, it was the diminutive “riccio”, or sea urchin, that lured me together with my son and friend Anna to Buggerru, a sleepy village on the west coast, attending a sea urchin festival which takes place here each April. In the late 1800s Buggerru (that’s ‘boo’ with a soft ‘g’ as in gentle) was a thriving mining town with hundreds of experienced miners coming to Sardinia from mainland Italy. With the closure of the mines early in the 20th century, the population dwindled and Buggerru went into a gradual decline. In recent years however, the whole area has been declared a UNESCO World Heritage Site and with the development of the marina and the opening of the old mining works to the public, Buggerru is slowly coming back to life. Today Buggerru has a population of just over 2000, but a large number of these locals, plus many more curious visitors including yours truly, gather in the port area where enormous trestle tables and benches are set up while a team of volunteers clean hundreds of locally-fished sea urchins in preparation for a lunch in celebration of this exquisite mollusc. We joined the never ending queue for our trays of ricci and spent the next 90 minutes in pleasant banter amongst ourselves and with the Italians queuing with us. 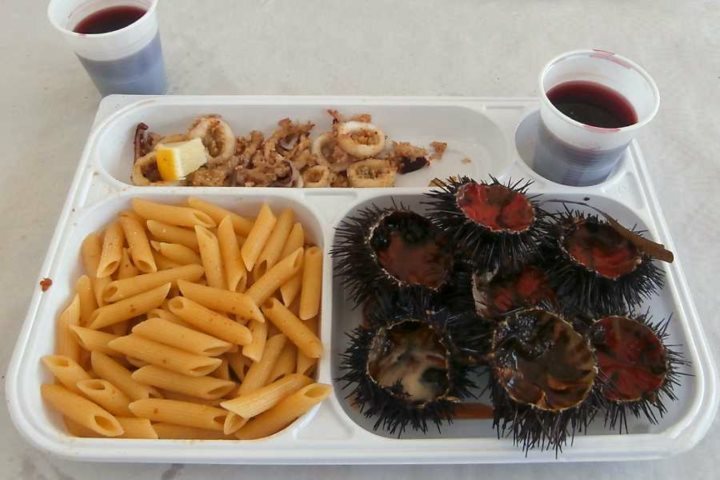 Eventually it was our turn and in exchange for the grand sum of €10 we received a tray each containing a plate of pasta with ricci sauce, 10 ricci, some octopus tempura and a plastic cup of wine. We amused the Italians seated at the same table as us when I transferred our wine into long stemmed wine glasses. I don’t object to eating with plastic forks or fingers but wine out of a plastic cup, no way! The long wait was worth it and the ricci, delicious. Towards the end of our meal we were joined at the table by another couple with a laden tray of ricci which they happily shared with us. It transpired that at 3.30pm they were among the stragglers and were rewarded with as many ricci as they could eat. We’ll know what to do next year! It was a great day out and the simplicity of the occasion and friendliness of everyone around us made it very special. PS. Can anyone give me Prince William’s postal address? If so, please write it below! Tempted by a flavour of Sardinia? 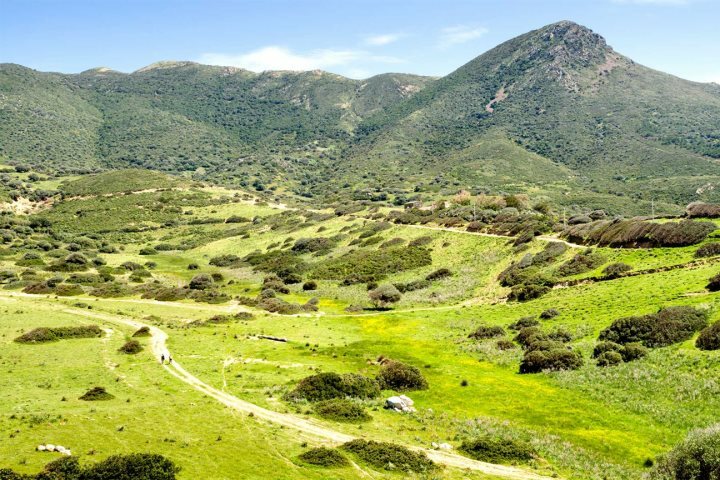 Check out some of our Sardinia holiday ideas for even more inspiration.